UNISON stewards are there to help all members with issues at work and one particular example is when a member is under disciplinary. 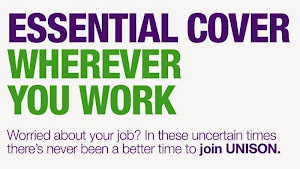 Oxford City's UNISON branch understand the stress and anguish when this situation occurs to our members and we are very experienced in dealing with a disciplinary. We have officers and stewards trained by the Regional Training programmes and we seek to represent and resolve the issue in the best interest of OUR members. One of our members was subjected to a disciplinary and one our esteemed stewards recognised that the investigation was not subject to procedure and that our member should have been praised for the work he did during an extremely emotional and stressful time rather than disciplined. Our Steward got him off all charges and highlighted concerns about management not following procedure at one of our leisure centres. Our Branch Secretary is meeting with the HR department of Fusion (who run our Leisure Centres) and will express the concerns the UNISON Branch have with management not following procedure. We will report on the outcome of this meeting. This is a great example of Oxford City's UNISON being there for members in times of crisis and representing you on your behalf for a positive solution. If you have any questions about the disciplinary process at Oxford City Council or have any other concerns that we can help with please do not hesitate to contact your Steward or email oxfordunison@gmail.com or contact the local branch office at 01865 252522. Following recent Membership Feedback relating to a previous article (dated 15/10/2013 Attendance Management Policy up for Review); Oxford City's UNISON Branch Committee recognised that members find it difficult to find the time to read an entire 50 page policy. Further to this, the Branch Committee recognises that it is difficult to give feedback when you do not know what changes are being proposed. The Branch has therefore AGREED to a new process for new and adjusted Policies and Procedures (Terms and Conditions). Send the Branch Secretary a completed form indicating the policy/procedure name and the date of the proposal and date to be implemented. Then each proposed policy or change to existing policy listed to ensure we understand what is proposed. The Branch Secretary informs the Branch Committee of the form and sends the form to the membership for their feedback on the proposals. The Branch Committee considers the proposals and the feedback from member to determine the next course of action and what counter proposals can be offered or what can be accepted. Negotiation Team meets with Management to get the best deal for members. Negotiation Team meets with Management to ensure the wording in the document reflects the proposals that have been AGREED. Branch Committee communicates the new Policy and Procedure to the members with the details of what they have won on their behalf. This new proposal ensures that YOU the MEMBERS have a direct opportunity to provide feedback on changes that are proposed AND you have the opportunity to express your own suggestions for improvements. If you want to have the ability to vote on these decisions the Branch Committee would welcome any volunteers to join. Please email oxfordunison@gmail.com or call the local branch office at 01865 252522. 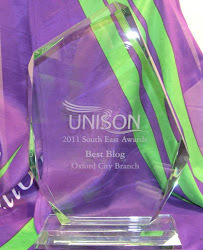 Oxford City's UNISON Branch Committee is supporting Oxford City Council's 'Best Companies "b heard" survey. The Branch Committee feel that feedback on this level is making a larger impact now than previous survey's and would hope that all of OUR Members voices are represented; you can do it in work time and the City Council will donate £1.00 to Maggies Oxford AND Crisis Skylight for ever survey returned! For more information call Oxford City Council's HR team on 252848. Thank you, Matthew, for your work on the blog. It's really good to find out what's going on in the branch. And I appreciate what the committee are doing on our behalf about changes to policies.